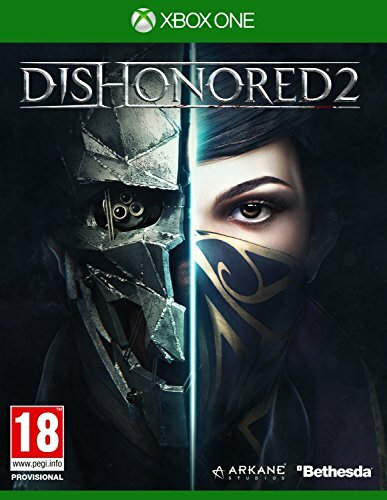 Dishonored 2 is a stealth based action adventure game, taking place in a fictional city based on Southern Europe called Karnaca. 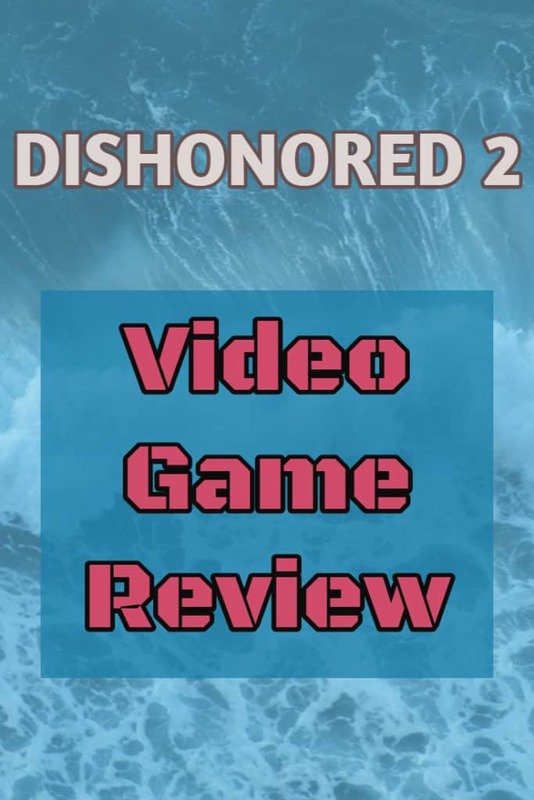 Taking place entirely from a first-person perspective, Dishonored 2 is much like Dishonored in that the moral choices you make change the world around you dramatically. 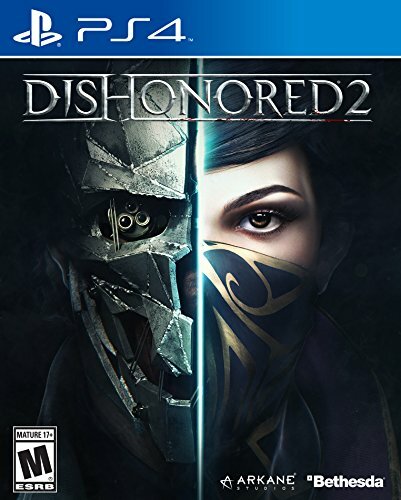 Dishonored 2 features two protagonists, Corvo Attano from the first game, and Emily Kaldwin, the girl you had to save in the first game, both now about 20 years older. With the two protagonists you can now switch between them for different playstyles. Corvo mostly retains abilities that he had in the first game. These abilities can be very powerful, if used correctly. For example, Corvo has the ability to “Blink,” meaning that in the blink of an eye, he teleports to a location within reach. Another useful ability is “Bend Time,” which allows you to slow down time and think about your next move when you’re in a fast moving engagement. Emily also her own unique set of abilities. Her abilities are brand new, unlike Corvo’s. One of her abilities is “Shadow Walk,” which allows her to turn into a dark, fast cloud. Another ability Emily has is “Domino,” an extremely useful ability that chains three people together, and whatever happens to one of them happens to all of them. The players must use these abilities to either stealthily navigate to your goal or to wreak havoc on everyone in your path. The second option, however, comes at a cost. There is a system in Dishonored 1 and 2 called the Chaos system, which tracks how many immoral deeds you commit. The more immoral, reckless, and destructive you are, the worse the world gets. In the first game, this was because of the plague spread from the rats, who were attracted to corpses. Hence, the more people you killed, the more corpses were left, the more plague was spread, and the more the defenses were stepped up by the bad guys. In Dishonored 2, there’s a very similar concept – bloodflies. Bloodflies make their nests in dead bodies, so you have to be careful about whether you kill people or just knock them out. Dishonored 2 is available on PS4, Xbox One, and PC. It comes in two editions: Standard and Collector’s. The Standard Edition comes with the base game, and is available either digitally or physically. 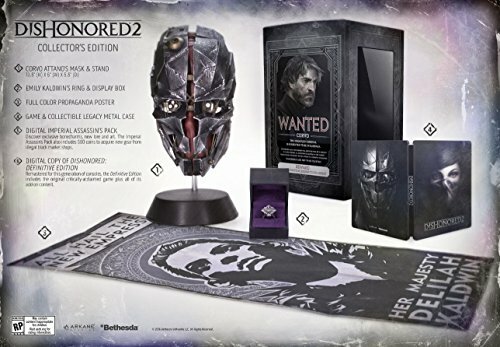 The Collector’s Edition includes a replica of Corvo’s mask with a stand, a wearable ring resembling Emily’s with a velvet-lined ring box, a propaganda poster, metal case, a DLC pack, and Dishonored: Definitive Edition, which is the first game remade for consoles, including all DLC from the first game. This video game is rated as mature so is suitable for ages of 17 and over.